Manor House Hotels offer the guest a more unique experience in luxury accommodation. This is often in an old country house where the history adds to the character of the house. 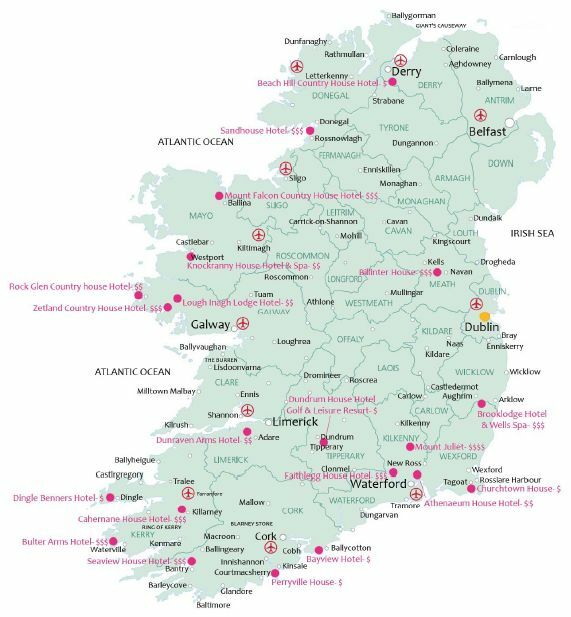 BMIT works with Trident Holiday Self Catering Homes, which offers about 700 properties with more than 60 locations around Ireland. In each location there are at least 8 properties clustered together, all identical in style and decor. Most are not more than 10 years old. They are all approved or registered by Failte Ireland, the Irish Tourist Board, which means they must reach a degree of excellence and must be maintained to the 2, 3 or 4 star recommendation they have been awarded by the Tourist Board. Single storey cottages/bungalows: These have all rooms on ground floor level, and are either modern or traditional in style. Dormer: These usually have a ground floor bedroom and bathroom, with the remaining bedrooms at first floor level. Townhouses: These are two storey houses, generally in a terrace style, with bedrooms and bathroom on first floor. Apartments: These are traditional style apartments, in small well?maintained custom?built blocks with private parking. A refundable security deposit of €200.00 must be paid on arrival. This is simply insurance against damage or breakage in the property. It is fully refundable after the stay. Utility charges (Electric, Gas & Oil) are an extra charge. The rates vary depending on the size of the house. This has to be paid directly. Children are very welcome and the houses are very suitable.